Children are the future of humanity – so if we want to cultivate a sustainable society where people are connected to our food and the land, it is critical to raise a generation of children who understand how to be good stewards of the earth. 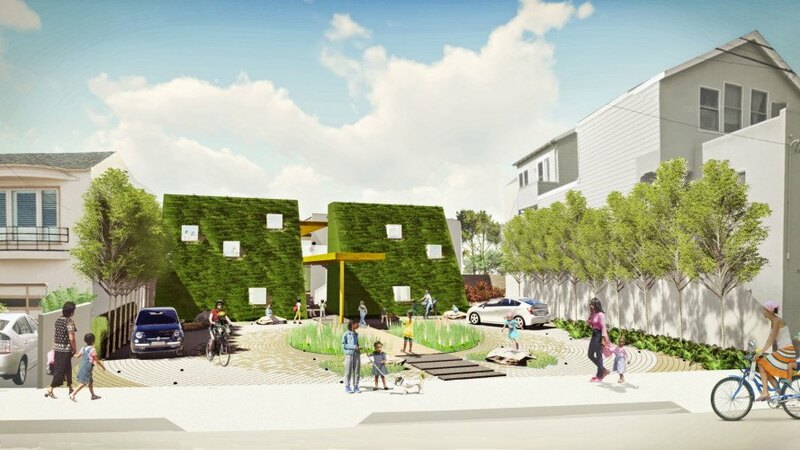 That’s why we’re very excited about this innovative urban farm school being built in San Francisco, California that will educate preschoolers through 8th graders with an ecology farm curriculum based on Waldorf Education. Project architect Stanley Saitowitz of Natoma Architects just unveiled plans for a stunning new plant-covered “living building” for the site that will house classrooms and act as a gathering space for the community at the farm. 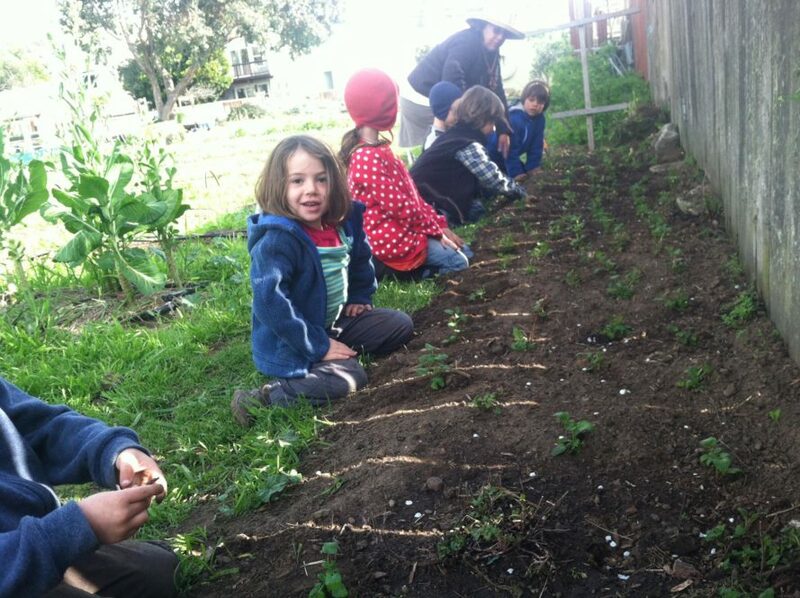 Tucked away on a hidden lot at 203 Cotter Street, in San Francisco’s Mission Terrace neighborhood is an urban farm that kindergartners, first and second graders at Golden Bridges school tend on a daily basis, growing kale, zucchini, onions, and other vegetables and herbs. The fledgling school with 55 students has been tending sections of the 1 acre lot for the past two years, while the school has been trying to design classroom buildings for the site that will serve the children and the unique character of the neighborhood. After much time at the drawing board, input from the community, and many changes in design, the school finally unveiled plans to house the nation’s first urban farm grade school in an innovative living structure that is as much landscape as it is a building. Since connection to the natural world is such a critical part of the Golden Bridges farm school ethos, we tried to design a building that is intimately connected to the land. This building is really a piece of the landscape, and it is alive. Taking inspiration from the pattern of detached single-family houses with backyards surrounding the lot, Natoma architects envisioned the school building broken up in a similar pattern, with classroom followed by courtyard, then classroom, then courtyard. The entire building structure will be topped with a green roof for water retention, insulation, and to provide natural habitat for pollinators, and this green roof will extend down the front slope of the building, effectively creating a “school hidden behind a hill”. A golden bridge will run through the center of the structure, connecting the various classrooms, courtyards and gathering spaces into one unifying (and symbolic) thread. While the exterior facade of the building will be clad in plants, the interior will be clad mostly in wood, in keeping with the Waldorf school emphasis on warmth, texture and natural materials. Glass will be used copiously on the south-facing rear of the structures to let in natural daylight, cutting the need for electricity, as well as providing healthy, sunny, well-lit indoor classroom spaces. 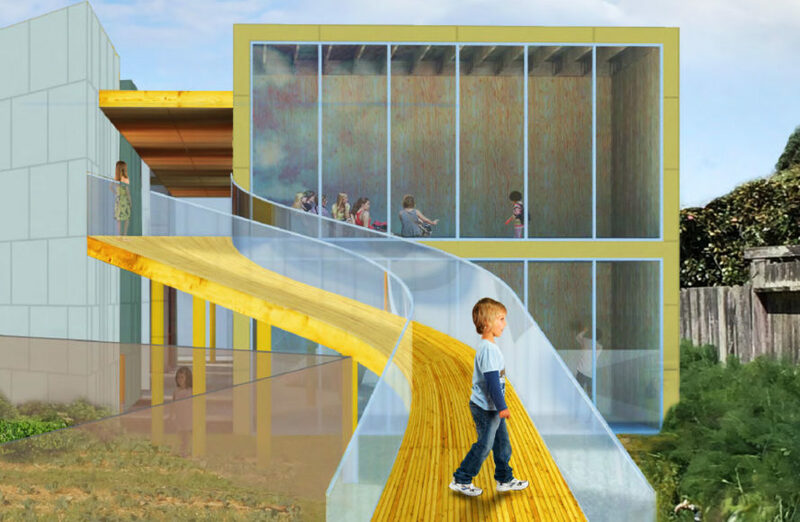 The Golden Bridge which runs through the entire space will arch down to the farm at the rear of structure, connecting the classrooms to the outdoor farm space and wild play space. The original lot at 203 Cotter Street had been an overgrown, derelict space, and then later, an urban farm, so it has never had any buildings on it. Because of this, some nearby neighbors are concerned about the noise, crowding, traffic and flooding potential of a new building in the neighborhood. In order to preserve neighborhood character and the lot’s green space, Natoma architects designed a low-lying building, deliberately shorter than the surrounding two-story houses, hidden behind a foliage-covered “hill” that is the living wall building facade. Covering both the building’s facade and roof with soil and plants to create a “Living Building” achieves a number of environmental and neighborhood objectives; the plants provide green space, air filtration and oxygen, and absorb storm water runoff to prevent flooding. The living roof and walls will also absorb sound to prevent excessive noise, and flowers planted on the green roof will provide food and support for the pollinators that are so critical to agricultural production. Flooding is a very real concern for the San Francisco farm school’s Mission Terrace neighborhood. 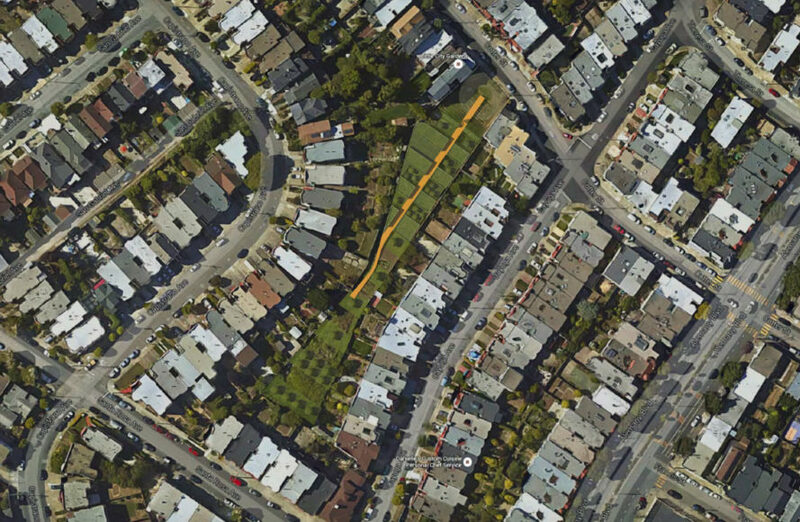 The community is situated in a low-lying valley where rainwater runoff from surrounding hills collects into Islais creek and runs downhill toward Cayuga Avenue. Added to this unfortunate geography is an overburdened and woefully inadequate sewer system which combines stormwater runoff with sewage into small clay pipes that can’t handle the volume of water. When there is more rain than usual, the stormwater backs up in the drains, mixing with sewage and then flooding Mission Terrace homes and streets with this disgusting raw sewage water. Residents of Mission Terrace have sued the city of San Francisco for damages to property, but as of yet, the issue remains unresolved. Golden Bridges open traffic circle at the entrance to the building will serve multiple functions; during school drop-off and pickup times it will provide temporary parking and traffic management, during the weekend and after school hours it will be a community space which will likely hold farmer’s markets as well as other community events. Finally the roundabout is a permeable surface with rainwater catchment cisterns hidden beneath the ground to store stormwater. The Golden Bridges School hopes to do their part to help the flooding situation by collecting stormwater onsite in water catchment basins, storing it in cisterns, and then recycling the greywater for irrigation on the farm. After construction is complete, the entire footprint of 203 Cotter Street will remain a permeable surface, as it is now, since there will be no pavement or hard surfaces, but open space combined with living roofs and facades. 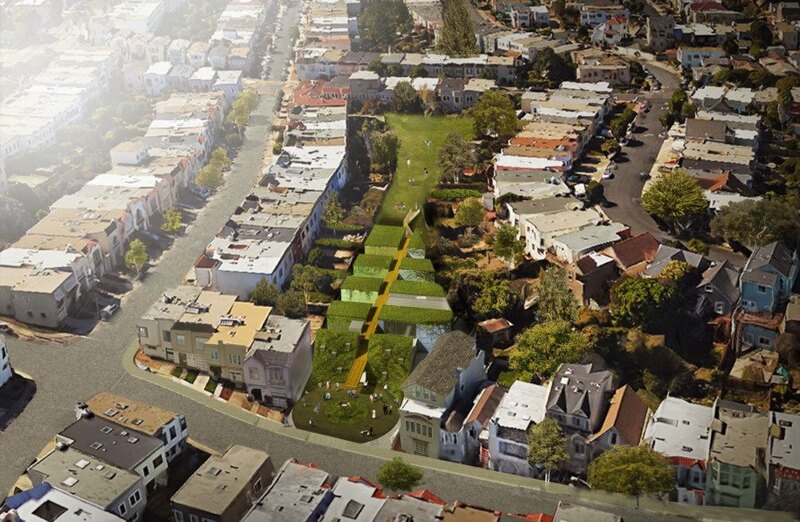 Natoma architects new design “lifts up the land” in addition to adding new water storage basins, so that the water carrying capacity of the site is planned to exceed that of the current empty lot to buffer stormwater. The new structure will actually provide additional storm water collection on site that doesn’t exist today – in underground basins, vastly improving the stormwater water retention and collection over the current unbuilt lot. Golden Bridges has also committed to campaigning San Francisco’s PUC to update the storm and sewage infrastructure of the neighborhood, which will be the ultimate change needed to stop the flooding. The 203 Cotter Street building will take up about 30% of the lot’s footprint, leaving the remaining 70% for open space, which will comprise both a wild landscape, and cultivated land, including a farm and orchards. 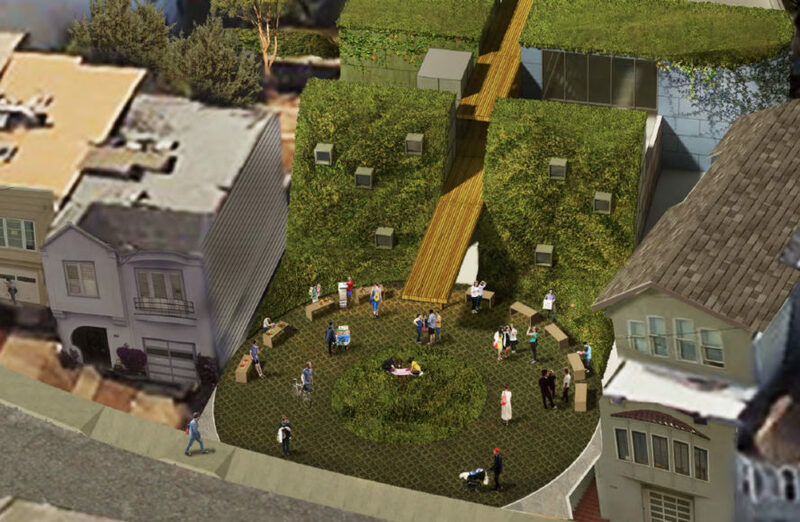 The landscape designers for 203 Cotter street will be SWA landscape, the same landscape architecture firm responsible for the spectacular green roof atop the California Academy of Sciences. Having dealt with such a massive and complicated living roof landscape on the California Academy of Sciences in Golden Gate Park proves they know their green roofs and will be able to deliver a successful and sustainable green roof for Golden Bridges farm school. Waldorf education is a progressive and holistic education system, based on 19th century philosopher Rudolph Steiner’s vision for education which helps to develop the “whole individual” – not only intellectual capacities, but also practical skills and social/moral development. The education system is deeply rooted in a sense of connection to the land and the seasons, which manifests through teaching children to understanding ecology, grow their own organic food and learn important practical skills such as farming, cooking, making clothing, and woodworking. Since Steiner also wrote extensively about agriculture, and was the founder of Biodynamic Farming and the CSA movement – it is not unusual to find Waldorf Schools located on a farm, or with a farm curriculum. However, many Waldorf farm schools (Summerfield, Hawthorne Valley) are out in the countryside on large plots of agricultural land. Golden Bridges School is unique is that it is located on a small plot of land, in a dense urban city, and sets the goal of providing a farm-based education for urban children, many of whom never have the opportunity to get out into the country. Scholarship Video from Golden Bridges School on Vimeo. Golden Bridges is unique in its social justice vision, which is supported by a “pay-what-you-can” tuition model. The goal of this sliding scale tuition model is foster economic diversity amongst it’s student body. Despite the fact that it is a private school, the student body isn’t the typical homogenous wealthy “private school” stereotype you might expect. More than 1/3 of Golden Bridges’ students are attending the school on scholarship (with another third of the families providing tuition assistance), representing the economic diversity of San Francisco as a whole. As the parent of two children at the Golden Bridges School, I’m naturally very excited to watch this project unfold and to hopefully see our farm school vision realized at last in San Francisco. Thanks for this article. I'm excited for this innovative building to become a part of our neighborhood! Very cool school, but it's certainly not the nation's first urban farm school. 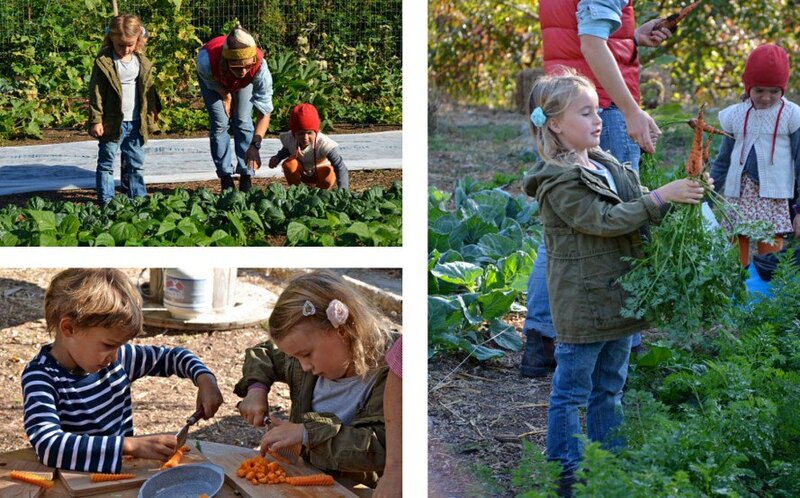 Sustainable Farm School (ages 3-13) was in Hartford, CT and Common Ground is in New Haven, CT. I've also visited some similar schools in NYC. Children are the future of humanity - so if we want to cultivate a sustainable society where people are connected to our food and the land, it is critical to raise a generation of children who understand how to be good stewards of the earth. 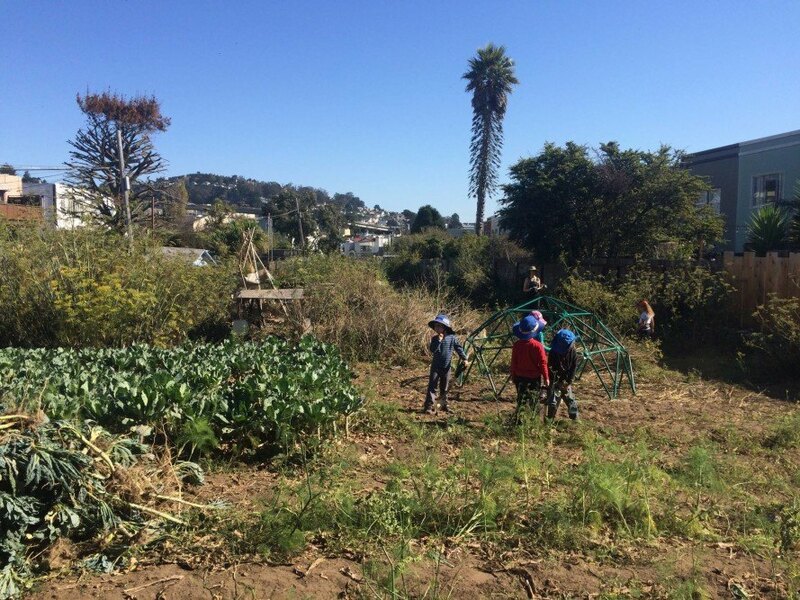 That's why we're very excited about the nation's first urban farm school being built in San Francisco, California that will educate preschoolers through 8th graders with an ecology farm curriculum based on Waldorf Education. Project architect Stanley Saitowitz of Natoma Architects just unveiled plans for a stunning new plant-covered "living building" for the site that will house classrooms and act as a gathering space for the community at the farm. 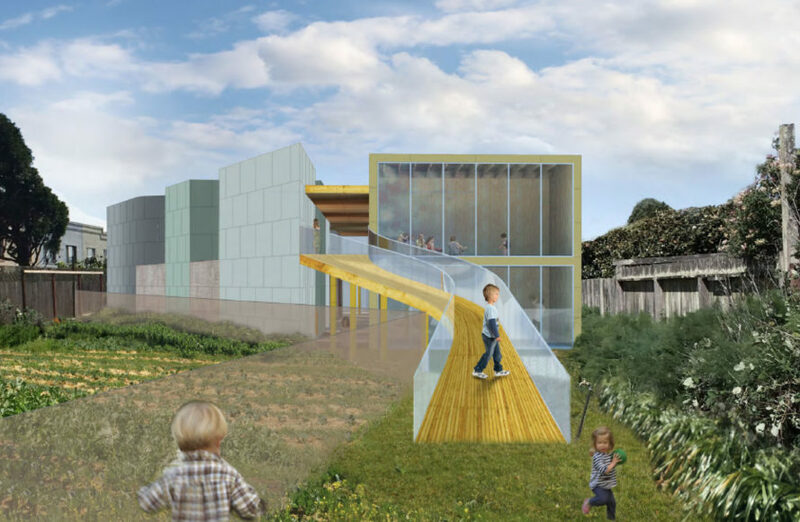 Golden Bridges School architect Stanley Saitowitz of Natoma Architects just unveiled plans for a stunning new plant-covered "living building" for the site that will house classrooms and act as a gathering space for the community at the farm. A golden bridge will run through the center of the structure, connecting the various classrooms, courtyards and gathering spaces into one unifying (and symbolic) thread. Tucked away on a hidden lot at 203 Cotter Street, in San Francisco's Mission Terrace neighborhood is an urban farm that kindergartners, first and second graders at Golden Bridges school tend on a daily basis, growing kale, zucchini, onions, and other vegetables and herbs. After much time at the drawing board, input from the community, and many changes in design, the Golden Bridges school finally unveiled plans for 203 Cotter Street; to house the nation's first urban farm grade school in an innovative living structure that is as much landscape as it is a building. Waldorf education is a progressive and holistic education system, based on 19th century philosopher Rudolph Steiner's vision for education which helps to develop the "whole individual" - not only intellectual capacities, but also practical skills and social/moral development. The education system is deeply rooted in a sense of connection to the land and the seasons, which manifests through teaching children to understanding ecology, grow their own organic food and learn important practical skills such as farming, cooking, making clothing, and woodworking. Tucked away on a hidden lot at 203 Cotter Street, in San Francisco's Mission Terrace neighborhood is an urban farm that kindergartners, first and second graders at Golden Bridges school tend on a daily basis, growing kale, zucchini, onions, and other vegetables and herbs. Since there are no buildings on site, the children currently take shelter under tents when it rains. The fledgling school with 55 students has been trying to design classroom buildings for the site that will serve the children and the unique character of the neighborhood. Waldorf education founder Rudolph Steiner is also the founder of Biodynamic Farming and the CSA movement, and because of this, it is not unusual to find Waldorf Schools located on a farm, or with a farm curriculum. However, many Waldorf farm schools are out in the countryside on large plots of agricultural land. Golden Bridges School is unique is that it is located on a small plot of land, in a dense urban city, and sets the goal of providing a farm-based education for urban children, many of whom never have the opportunity to get out into the country. Golden Bridges School has been tending sections of the 1 acre lot at 203 Cotter Street for the past two years, while trying to design classroom buildings for the site that will serve the children and the unique character of the neighborhood. As is clear from this aerial plan drawing for 203 Cotter Street, the farm school merely the raises the earth into a hill. Since all of hte buildings are covered with living roofs, no green space will be lost from the footprint in the construction of the Golden Bridges Farm School buildings. Taking inspiration from the pattern of detached single-family houses with backyards surrounding the lot, Natoma architects envisioned the school building broken up in a similar pattern, with classroom followed by courtyard, then classroom, then courtyard. The entire building structure will be topped with a green roof for water retention, insulation, and to provide natural habitat for pollinators, and this green roof will extend down the front slope of the building, effectively creating a "school hidden behind a hill". The entire building structure will be topped with a green roof for water retention, insulation, and to provide natural habitat for pollinators, and this green roof will extend down the front slope of the building, effectively creating a "school hidden behind a hill". After construction is complete, the entire footprint of 203 Cotter Street will remain a permeable surface, as it is now, since there will be no pavement or hard surfaces, but open space combined with living roofs and facades. The Waldorf school emphasis on warmth, natural light, texture and natural materials is showcased in the building's interior design. The original lot at 203 Cotter Street had been an overgrown, derelict space, and then later, an urban farm, so it has never had any buildings on it. Here is a view of the lot from the back. Project architect Stanley Saitowitz of Natoma architects says he was trying to design a building that would match the ecological and pioneering ethos of the Golden Bridges school, while maintaining the green space of the farm and minimizing impact on neighbors in the quiet residential neighborhood. Golden Bridges School is unique is that it is located on a small plot of land, in a dense urban city, and sets the goal of providing a farm-based education for urban children, many of whom never have the opportunity to get out into the country. The 203 Cotter Street building will take up about 30% of the lot's footprint, leaving the remaining 70% for open space, which will comprise both a wild landscape, and cultivated land, including a farm and orchards. Glass will be used copiously on the south-facing rear of the structures to let in natural daylight, cutting the need for electricity, as well as providing healthy, sunny, well-lit indoor classroom spaces. 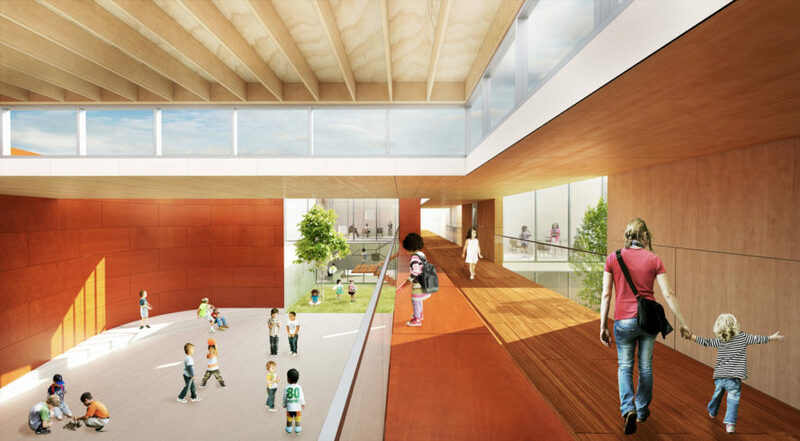 Stanley Saitowitz and Natoma architects chose warm, natural materials to match the school's ecological ethos. 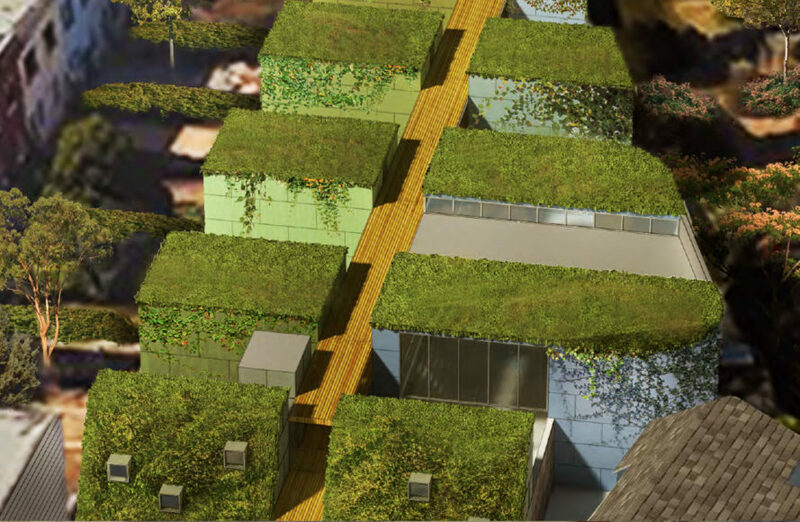 Covering both the building's facade and roof with soil and plants to create a "Living Building" achieves a number of environmental and neighborhood objectives; the plants provide green space, air filtration and oxygen, and absorb storm water runoff to prevent flooding. In order to preserve neighborhood character and the lot’s green space, Natoma architects designed a low-lying building, deliberately shorter than the surrounding two-story houses, hidden behind a foliage-covered “hill” that is the living wall building facade. The Golden Bridges School hopes to do their part to help the neighborhood's flooding situation by collecting stormwater onsite in water catchment basins, storing it in cisterns, and then recycling the greywater for irrigation on the farm. The school's Waldorf education system is deeply rooted in a sense of connection to the land and the seasons, which manifests through teaching children to understanding ecology, grow their own organic food and learn important practical skills such as farming, cooking, making clothing, and woodworking. More than 1/3 of Golden Bridges' students are attending the school on scholarship (with another third of the families providing tuition assistance), representing the economic diversity of San Francisco as a whole. Farming and working with the natural cycles of the seasons is a fundamental part of Waldorf education. Here first graders tend a plot of kale at 203 Cotter Street School Farm. Waldorf education is a progressive and holistic education system, based on 19th century philosopher Rudolph Steiner's vision for education which helps to develop the "whole individual" - not only intellectual capacities, but also practical skills and social/moral development.